Cricket just updated their Muve Music enabled cell phone lineup with budget friendly cheap ZTE Chorus Android running handset. It has a 600MHz CPU, 3.2-inch resistive 262K TFT touch display, and 2MP camera. CDMA ZTE Chorus support up to 32Gb of MicroSD card. But its battery is only 1000 mAh.You have to pay $40 after rebates and sign a 2-year contract to buy this phone from Cricket. Read the full PR to know every detail about ZTE Chorus. SAN DIEGO, Nov. 23, 2011 — /PRNewswire/ — Cricket Communications, Inc., a leading provider of innovative and value-driven wireless services and a wholly-owned subsidiary of Leap Wireless International, Inc. (NASDAQ: LEAP), and ZTE, a leading global provider of telecommunications equipment and network solutions, today announced availability of the ZTE Chorus™ featuring Cricket’s Muve Music service. The ZTE Chorus is ideal for value-conscious consumers looking for a single device to simultaneously manage their mobile and music needs. The bar-style feature phone delivers high functionality with 3G web browsing capabilities and 600 megahertz of processing power while serving as an ideal platform for Cricket’s innovative and unlimited Muve Music service. The ZTE Chorus incorporates SRS WOW HD technology for advanced audio playback quality and a dynamic 3D entertainment experience with a deep, rich bass and high-frequency clarity. Users can customize their sound preferences with SRS sound settings that complement popular music styles including acoustic, blues, hip hop, pop and rock. The ZTE Chorus provides a robust multimedia experience with its vibrant 3.2-inch WQVGA TFT display with resistive touch screen, 2.0MP camera/camcorder, music and video players, stereo Bluetooth™, and speech recognition capabilities. XT9 Trace technology and a virtual keypad provide a convenient messaging experience with fast and easy text entry. In addition to Muve Music, the ZTE Chorus comes preloaded with Mobile Web, MyBackup, MyAccount, Cricket Storefront and three customizable idlescreens. The ZTE Chorus, with an MSRP of $119.99, is available for as low as $39.99 for a limited time at www.mycricket.com, Cricket branded retail stores and dealers. With the $55 per month Muve Music plan for the ZTE Chorus, Cricket Wireless customers will enjoy unlimited song downloads, ringtones, and ringback tones, as well as unlimited text, picture, and video messaging, 3G mobile data, mobile video, data back-up, and 411 assistance. Muve Music is the first unlimited music service to be included as part of a wireless rate plan and now has more than 270,000 customers. By applying its philosophy of unlimited services and value innovation, Cricket and Muve Music have given their customers a new music experience that ranks high in customer satisfaction. 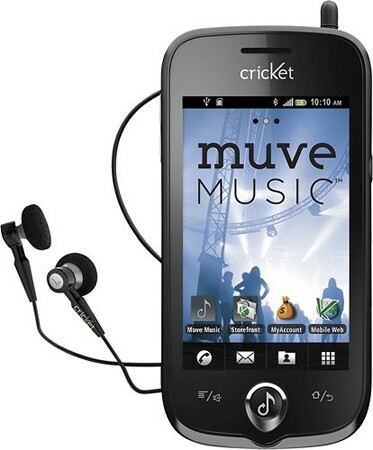 For more information about Muve Music, visit www.muvemusic.com, and for Cricket’s dynamic device lineup, visit www.mycricket.com. For the latest Cricket news and updates online, follow us on Facebook and Twitter.